Found her on the 1910 New Albany Ward 4, Floyd, Indiana census (dist 75 img 4) as Delmont Trotter age 42. Found her on the 1930 Ghent, Columbia, New York census (dist 19 img 3) age 41. Found him on the 1850 (not stated), Catawba, North Carolina census (img 155) as Abel Angel age 33, farmer. Found him on the 1860 (not stated), Catawba, North Carolina census (img 27) as Abel Angel age 40, farm laborer. Living next door to him is John Angel age 71, his father. Found him on the 1870 Jacobs Fork, Catawba, North Carolina census (img 11) as Able Angel age 54, farmer. Found him on the 1880 Jacobs Fork, Catawba, North Carolina census (dist 46 img 4) as Abel Angel age 63, farmer. Found her on the 1900 Arnold, Westmoreland, Pennsylvania census (dist 78 img 17) as Kate Finger age 35. Found her on the 1920 Glassboro, Gloucester, New Jersey census (dist 141 img 10) as Kathryn Finger age 58. Father, mother born Germany. Found her on the 1930 Glassboro, Gloucester, New Jersey census (dist 11 img 18) as Catharine Finger age 69. 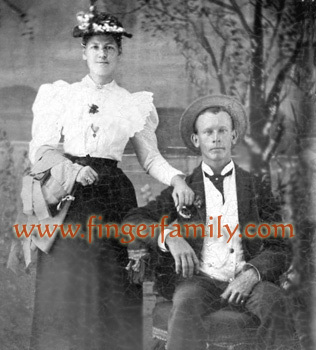 Baptism sponsors were Conrad Finger & wife Anna Berringer. Found him on the 1910 Elk, Gloucester, New Jersey census (dist 120 img 11) age 48, farmer. Found him on the 1930 Elk, Gloucester, New Jersey census (dist 6 img 18) age 68, widower, farmer. Father, mother born Germany. He is living next to his son George. Found her on the 1870 Funks Grove, McLean, Illinois census (img 17) as Emma Finger age 7. Found her on the 1900 Sherman, Crawford, Kansas census (dist 88 img 23) as Emma Craft age 37. Has given birth to 6 children, 6 are living. Father, mother born Germany. Found her on the 1910 Waynesville, DeWitt, Illinois census (dist 86 img 13) as Emma L. Craft age 47. Found her on the 1920 Waynesville, DeWitt, Illinois census (dist 103 img 22) as Emma L. Craft age 57, widow. Her widowed father Ferdinand Finger age 80 is living with her family. Found him on the 1850 Blount County, Tennessee census (dist 15 img 2) as Henry Finger age 18. Found him on the 1860 District 12, Blount, Tennessee census (dist 12 img 3) age 29, single, living with his brothers and sisters Eliza, Susan, John, Marion, and Frank. Found him on the 1870 District 6, Blount, Tennessee census (img 14) as Henry Finger age 35, single, living with his brothers and sisters Eliza, Susan, and John. His brother Marian is living next door. Found him on the 1880 District 6, Blount, Tennessee census(dist 192 img 9) as Henry Finger age 49, single, living with his brothers and sisters Eliza, Susan and John. Also 2 children France age 8 and Ellen age 1. His brother Marion is one dwelling away. Found him on the 1900 Civil District 6, Blount, Tennessee census (dist 18 img 13) as Henry Finger age 69, farmer. This census says born Jan 1831. Found him on the 1910 Civil District 6, Blount, Tennessee census (dist 20 img 15) as Henry Finger age 81, own income. Henry was born on Jan. 1, 1830 to Jonas and Delila Sliger Finger in their Washington County home. His parents later moved to Blount County [Tennessee], and Henry Finger worked as a farmer like many of his forefathers. He enlisted on Aug. 31, 1862 in Barbourville, Ky. and mustered out on May 16, 1865 in Nashville. On his son Avery's death certificate he is listed as Hebron Finger, Sr.
Found him on the 1880 Ivy Hill, Haywood, North Carolina census (dist 94 img 8) as Heburn L. Finger age 14. Found him on the 1900 Ivy Hill, Haywood, North Carolina census (dist 28 img 15) as Jacob H. L. Finger age 34, farmer. Many of his children are listed by different names. and Callie is listed as Lavatie C. Finger. His sister Catherine Rich and her family are living next door. Found him on the 1910 Ivy Hill, Haywood, North Carolina census (dist 64 img 1) age 43. Found him on the 1920 Ivy Hill, Haywood, North Carolina census (dist 76 img 16) as Hebron L. Finger age 53, farmer. Found him on the 1920 Manhattan Assembly District 14, New York, New York census (dist 1021 img 5) as John Finger age 1 year 1 month. Found him on the 1900 Civil District 8, Blount, Tennessee census (dist 19 img 12) as Joseph A. Finger age 15. Found him on the 1910 Civil District 10, Blount, Tennessee census (dist 26 img 1) age 25, farmer. Found him on the 1920 Civil District 11, Blount, Tennessee census (dist 135 img 10) as Joseph Finger age 34, teamster, sawmill. Found him on the 1930 Miser Station, Blount, Tennessee census (dist 5 img 18) age 45, farmer, general farm. Found him on the 1930 Bayonne Ward 3, Hudson, New Jersey census (dist 212 img 6) as Kenneth Finger age 9. Found him on the ship's passenger list Araguaya taking a trip with his mother to West Indies, March 28 to April 11, 1929. His age is given as 6 years, 1 month. Found him on the 1910 Fort Dodge Ward 1, Webster, Iowa census (dist 215 img 7) age 5. Found him on the 1915 Paton, Green, Iowa state census age 10. Found him on the 1925 Paton, Green, Iowa state census age 20, single, living at home. Found him on the 1940 Nevada, Story, Iowa census (dist 85-29 img 11) as Lloyd M. Finger age 35, farm laborer. He and his wife Dorothy are living in the household of her parents Lewis and Bernice Applegate. Found her on the 1860 Benton, Yates, New York census (img 57) as Margaret Finger age 2 months. Found her on the 1870 Benton, Yates, New York census (img 39) as Maggie Finger age 10. Found her on the 1880 Benton, Yates, New York census (dist 215 img 36) as Maggie Finger, age 20, living with her widowed father Norton Finger. Found her on the 1900 Milo, Yates, New York census (dist 140 img 16) as Margaret newby age 40. Found him on the 1920 Bixby, Perkins, Minnesota census (dist 174 img 1) age 8. Found him on the 1930 Carroll, Carroll, Iowa census (dist 6 img 2) age 18, baker, bakery. He is single and a lodger in the household of Frank Rettenmeier. Found her on the 1900 Riga, Lenawee, Michigan census (dist 57 img 33) as Opal Finger age 15. Found her on the 1910 Blissfield, Lenawee, Michigan census (dist 56 img 17) age 23, married. They are living next door to her parents, Ellis and Lydia Finger. Found her on the 1920 Otsego, Allegan, Michigan census (dist 30 img 31), age 34. Father born Michigan, mother born Indiana. Found her on the 1930 Alamo, Kalamazoo, Michigan census (dist 1 img 15) as Opal J. McNutt age 44. Found him on the 1910 Civil District 3, Knox, Tennessee census (dist 108 img 27) age 5. Found him on the 1920 Civil District 17, Knox, Tennessee census (dist 143 img 4) as Roy C. Finger age 15. Found him on the 1930 Knoxville, Knox, Tennessee census (dist 63 img 40) age 25, bookkeeper, bank. Found him on the 1940 Other Places, Knox, Tennessee census (dist 47-47 img 5) as Roy C. Finger age 35, clerk, bank. Found her on the 1900 Cherryville, Gaston, North Carolina census (dist 75 img 25) as Sallie J. Finger age 18. Found him on the 1900 Ironton, Lincoln, North Carolina census (dist 109 img 29) age 17. Found him on the 1910 Ironton, Lincoln, North Carolina census (dist 69 img 49) age 24. He is shown to be a widower, and he and his son Garland are living with his parents. Family 1 : Jansen Wallace DEDERICK Jr.
Found him on the 1930 Marion, Marion, South Carolina census (dist 5 img 6) age 1 year 7 months. Found her on the 1900 Jerusalem, Yates, New York census (dist 136 img 2) as Ella Finger, age 38. Has given birth to 3 children, 3 are living. Found her on the 1910 Jerusalem, Yates, New York census (dist 175 img 25), age 48. Found her on the 1920 Jerusalem, Yates, New York census (dist 176, img 22) as Ella Finger age 58. Found him on the 1900 Charlotte Ward 1, Mecklenburg, North Carolina census (dist 44 img 23) as Wesly Pickens age 35, telegraph operator. He and his wife are living with her parents. Found him on the 1910 Charlotte Ward 4, Mecklenburg, North Carolina census (dist 103 img 15) as Wesley B. Pickens age 41. Found him on the 1920 Charlotte Ward 4, Mecklenburg, North Carolina census (dist 144 img 28) as Wesley B. Pickens age 51, clerk, railroad. Born South Carolina. Found him on the 1930 Charlotte, Mecklenburg, North Carolina census (dist 21 img 47) as W.B. Pickens age 65, shipping clerk, railroad. Born North Carolina. Also found him on the 1930 Charlotte, Mecklenburg, North Carolina census (dist 21 img 49) as W.B. Pickens age 62, shipping clerk, railroad. Born South Carolina. At high noon Wednesday occurred the marriage of Miss Anna Grace Rettew of Carbondale, to Charles Frederick Bushwaller, of Honesdale. The ceremony was performed at the home of the. bride's father, Hon. C. E. Rettew, of John street, in the presence o'f a large gathering of friends. The,wedding ceremony was read by Rev. George C. Graham, rector of Trinity church.. The couple was unattended. The bride was-attractively attired in a white wedding gown. The wedding marches were played by Miss Mabel Lowry. Following the ceremony there was an elaborate wedding reception followed by a wedding dinner. Mrs. Bronson catered. Mr. and Mrs. Bushwaller left on an afternoon train for a wedding trip, upon the completion of which they will reside in Honesale. Among the out-of-town guests at the wedding were: Miss Minnie Bushwaller, Misses Emma and Hannah Bushwaller, Miss Florence Bunnell, Mrs. C. Hartung, Mr. and Mrs. C. H. Rettew and Master Charles Rettew, of Honesdale; Mrs. R. N. Rettew of Philadelphia, and Mrs. William Longshore, of Rutledge, Pa. The Citizen November 22, 1912. Found her on the 1900 Carbondale Ward 1, Lackawanna, Pennsylvania census (dist 7 img 2) as Grace Rettew age 12. Found her on the 1910 Carbondale Ward 1, Lackawanna, Pennsylvania census (dist 8 img 1) as Anna Rettew age 22, single, living at home. Found her on the 1900 Kings Creek, Cabarrus, North Carolina census (dist 24 img 39) as Annie Shely age 1. Found her on the 1920 Charlotte Ward 4, Mecklenburg, North Carolina census (dist 144 img 8) as Annie Shealy age 20, single, living at home. Found him on the 1930 Knoxville, Knox, Tennessee census (dist 71 img 27) as Edward Underwood age 8. Found him on the 1850 Potter, Yates, New York census (img 36) age 22, cooper. Found him on the 1880 Benton, Yates, New York census (dist 215 img 27), age 52, farmer. He is living next to John and Lucy Finger. Also in his household are Martha Babbitt age 39, widow; Warner Babbitt age 18; and Delos Finger age 20. Found her on the 1870 Saugerties, Ulster, New York census (img 183) as Maggie Wolven age 5.